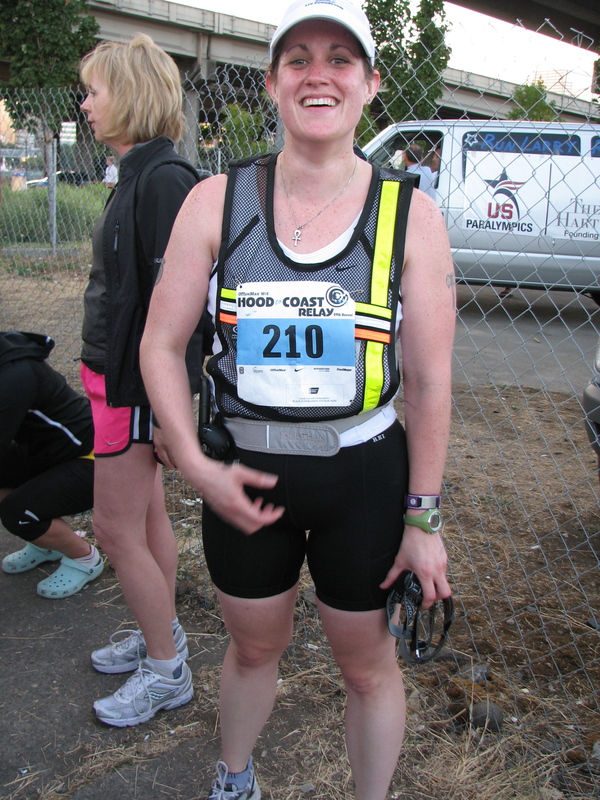 Today is Sunday, the day after Hood to Coast. I just finished uploading all my photos, deleting and organizing them. I love that I was able to take so many great photos of this event. I hope I can succinctly describe the 31 hours of my life that I spent participating in this epic event. Since I was the last runner in our van (Van #2 for the team) I had all day to anticipate my first run and get totally pumped up. 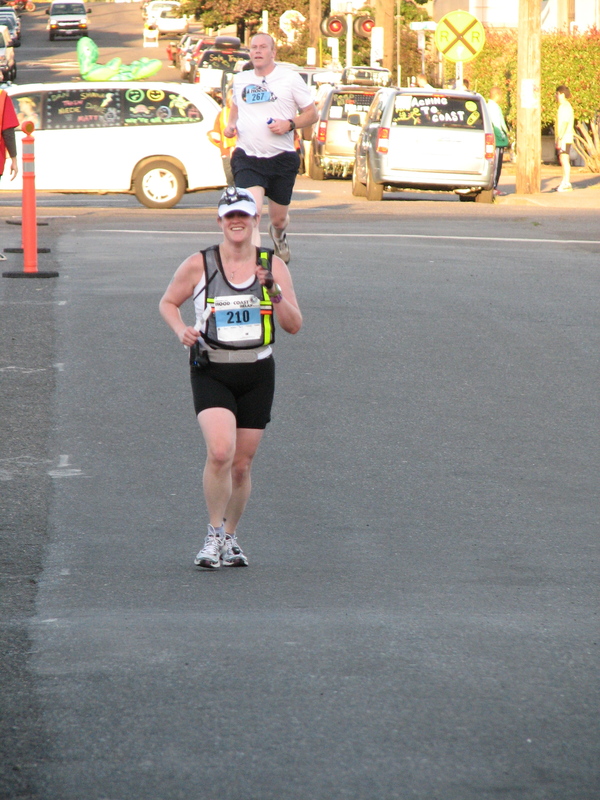 I didn’t start to get nervous until there were two runners ahead of me. They were both fast guys and I knew that I’d be up sooner than we’d thought. We parked the van where the Race Officials directed us and had to walk a few blocks to get to the Exchange Site. I was dressed and had my hydration belt on. I ate one GU and had another one in my belt for during the run. Michael made it down to Johnson Creek on his bike to see me off. If I hadn’t been overly excited about my run BEFORE that, I was bursting at the seams when I saw him waiting for me! It was so cool and I had too many emotions inside me to express any of them. 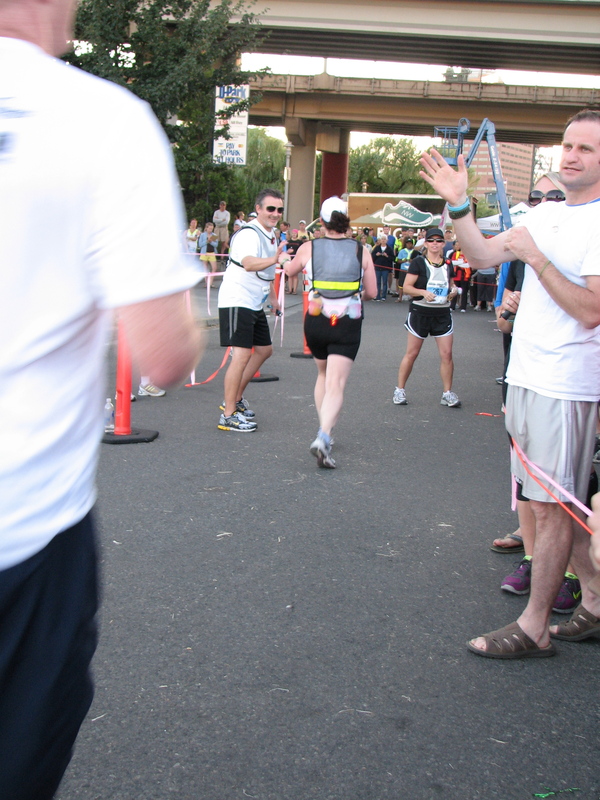 What I loved most about my first leg was that I knew the area like the back of my hand. 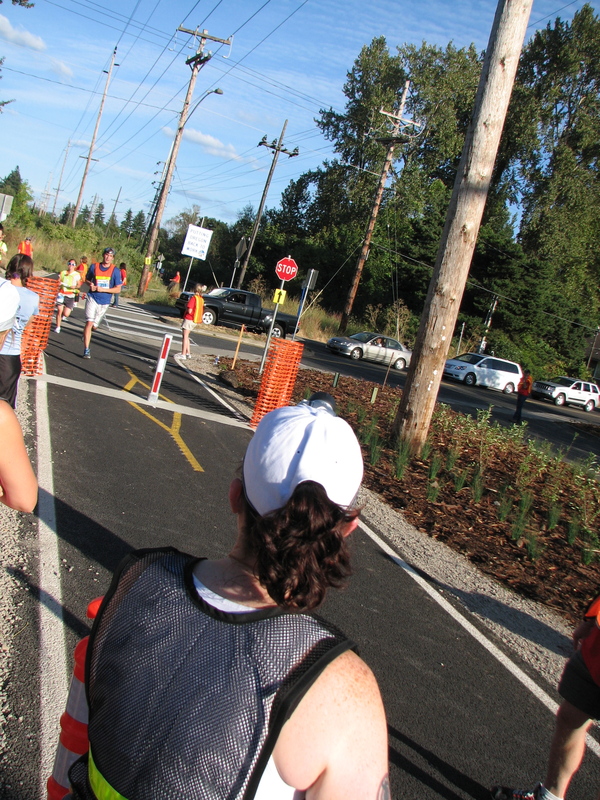 It started at Johnson Creek and went down the Springwater Trail to connect to the waterfront loop. I KNOW that loop! I kinda run it all the time. 😉 But the Springwater is where Michael and I do a lot of cycling. I was 100% confident that I could crush my first leg. I was so nervous and excited I could barely stand still! I was ready and waiting for James. 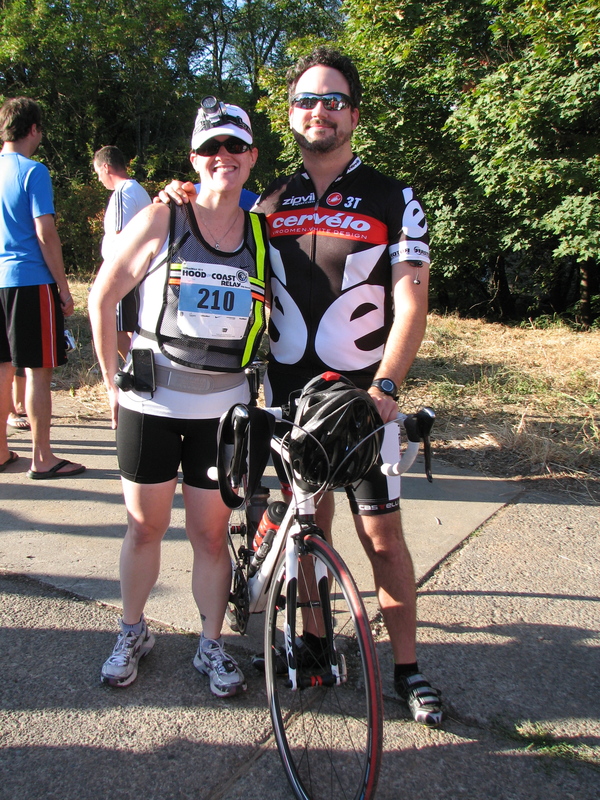 He had I think 4 miles or so of flat trail and I knew he’d be there really quickly. He was! I saw James in the distance and got in place to get the wrist strap. He tagged me and I took off! It was surprisingly quiet and empty on the Springwater Trail. I was expecting a lot of people running with me, but the staggering in conjunction with people having different paces meant I was never really running “with” many people. It was quite solitary. But that’s how I like to run anyways. The speaker that Michael gave me worked great and I loved having it. I was able to listen to my music (even though I didn’t really notice it) and ran my little heart out. I had intended to pace myself on my first Leg. I knew it was the longest and I didn’t want to hurt myself too soon. Yeah right. Which I knew would happen! I ran at a pace that felt good (which means a faster, exaggerated pace of course) and ran down the trail. A few people passed me, I passed a few people. 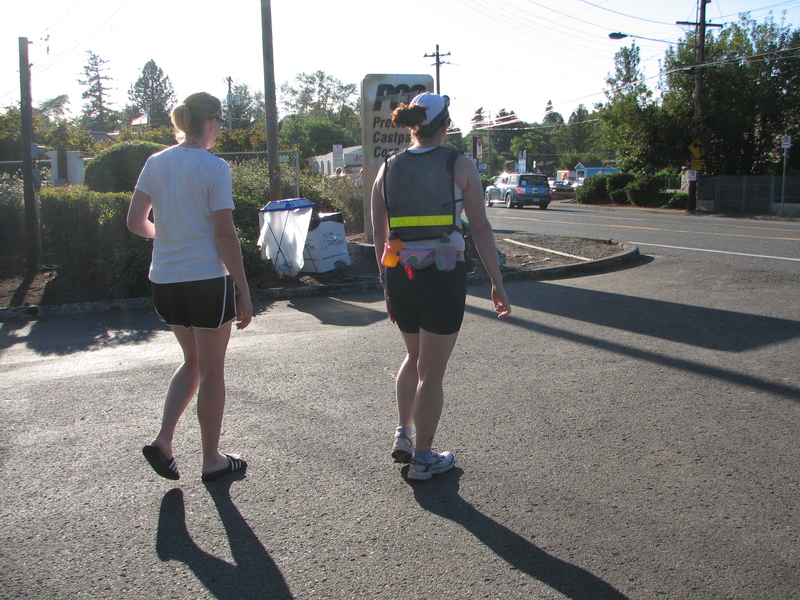 I got to the part of the Springwater trail where it goes onto the neighborhood streets in Sellwood. I had to stop at one crosswalk to wait (which sucked) and then continued on. Since I wasn’t seeing any runners with me, I started to get a little worried. “Did I take a wrong turn?” I kept looking for other runners or signs. I thought that maybe in my cockiness of knowing that route, I overlooked a turn somewhere. But then I saw a sign that said “HTC” with an arrow and I was on the right path. I ran down hill to Oaks Park where the trail picked up again. Some kind strangers were sitting by the side of the trail cheering for the runners and passing out cups of water with electrolytes in them. I grabbed one as I ran passed, said “Thank you!” poured more on my face and chest than drinking and tossed the cup. A few minutes later (about half way into my run) I ate one of my GUs. 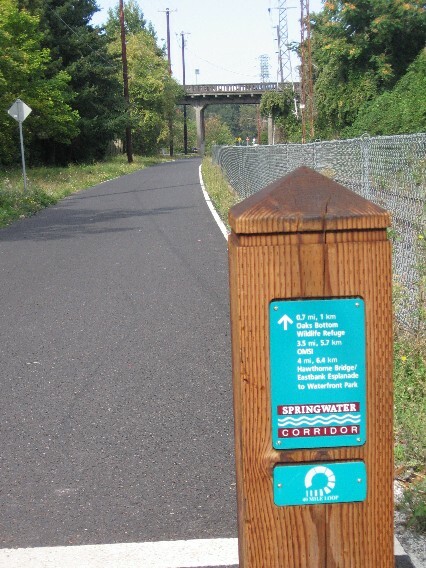 I finished running on the Springwater trail and instead of continuing on to the other part, the route went passed the OMSI parking lot and down the street. I was feeling pretty good. I wasn’t tired, I wasn’t sore yet. AND I HADN’T WALKED AT ALL! In training for this, I’d done 7 mile training runs twice but both times I had to walk at least a mile or two of those. 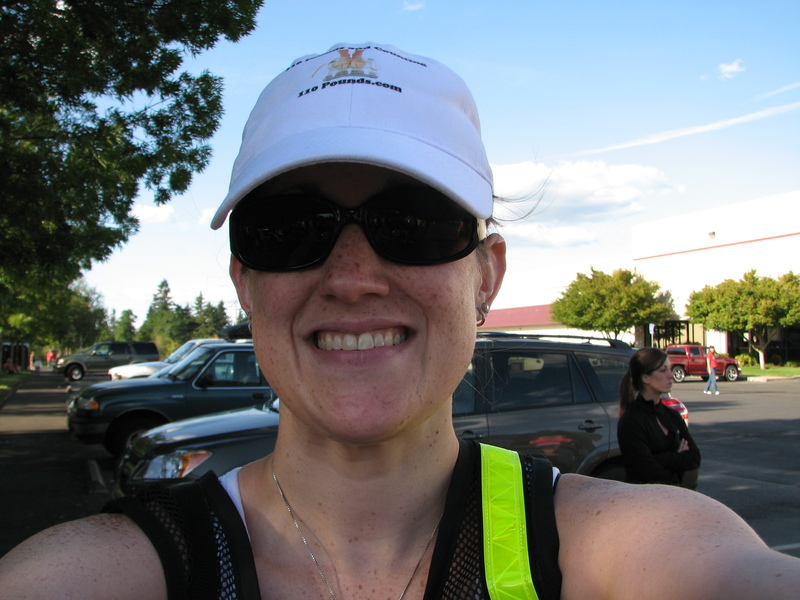 Not during Hood to Coast! My goal was: NO WALKING. 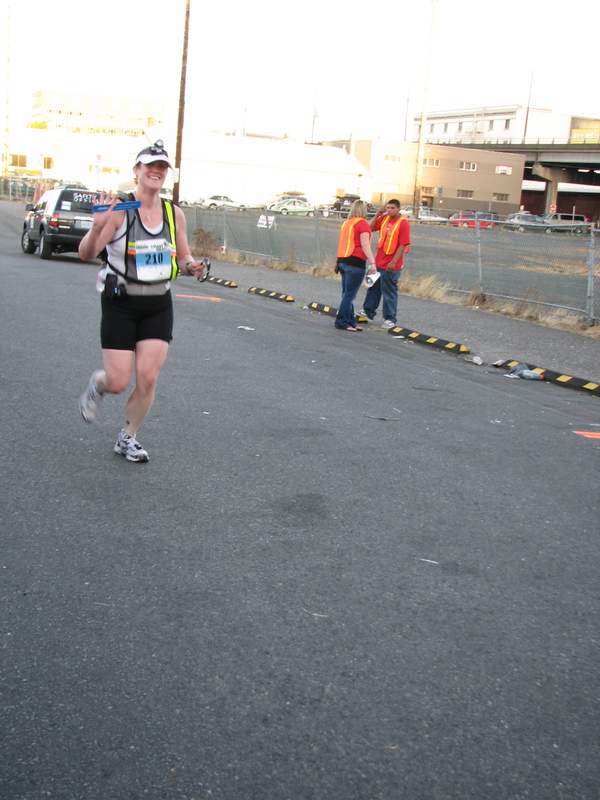 My ankle was starting to ache that last mile or two of the run. 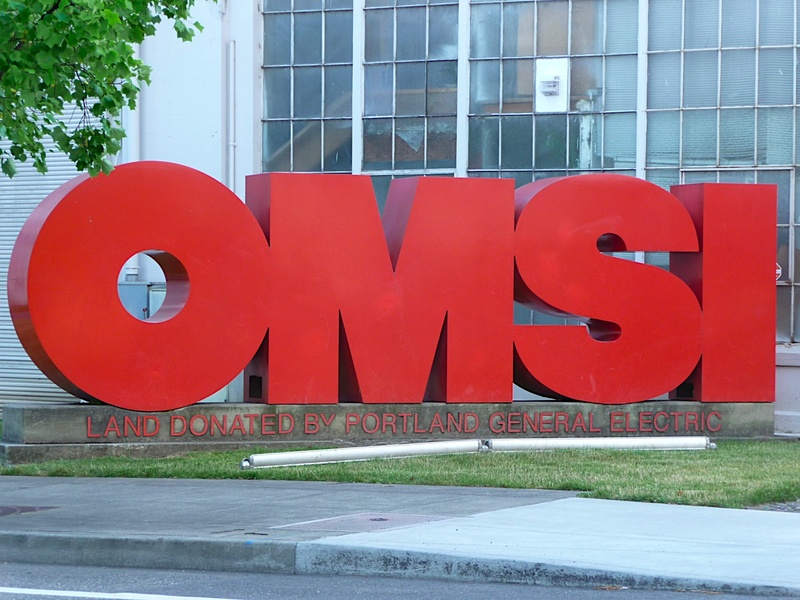 Once I saw the OMSI sign, I knew I was getting close. The route turned and I saw that the humongous empty parking lot under the Hawthorne Bridge was going to be the Exchange point. It was PACKED. Not only that, the energy was contagious. 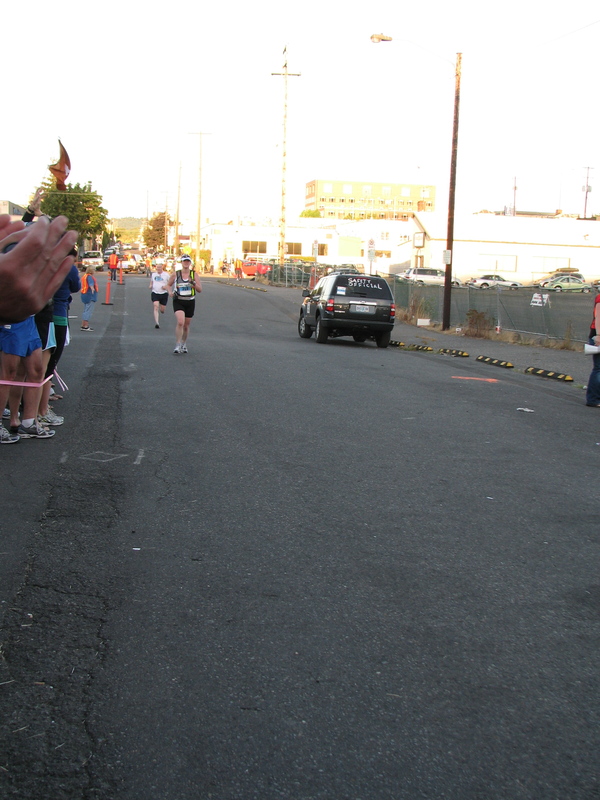 The entire crowd cheered for every runner and man was it an amazing feeling to have like 200 people cheer for you as you cross the finish line! I saw my entire team and heard them cheering for me. I waved as I ran by! Terry grabbed the wrist band and took off. I jogged a few more steps and tried to slow down. I found an empty spot to stretch a little and relax. I found the rest of my team and they congratulated me and took a bunch of photos. Everyone was really nice and enthusiastic. Then my teammate’s (Allen) phone rang. It was Terry!! He answered the phone and asked why he was calling when he should be running. THE HAWTHORNE BRIDGE was UP!!! Seriously?!?!? Terry’s wife Leslie (my coworker and Team Captain) started freaking out and said “Did he make it across the Bridge before it went up?” No. Then Leslie said, “START SWIMMING TERRY!” It was a pretty funny moment but I hope the bridge wasn’t up for too long. We walked back to the Van and our teammates in Van #1 took off to do their second set of legs. They had to hurry to the next Exchange Point to meet Terry. I immediately laid down on the gravel and pavement next to the van to do my stretches. I was determined to do everything right and NOT screw it up by not stretching. It felt so fantastic to stretch. I felt awesome. I was still flying HIGH from the run and could not believe I just ran almost 7 miles so fast! Wow, I’m impressed … and this was only the start! Congrats on your accomplishments! I just started following your blog (found it on the HLB website). Can you tell me about the HR monitor you wear on your wrist? I start a running training program in a couple of weeks and am hoping to find a simple HR monitor/distance/calorie counter. Thanks! Thanks! If you want one that tracks distance I suggest a Garmin Forerunner. That’s what I want to get soon. 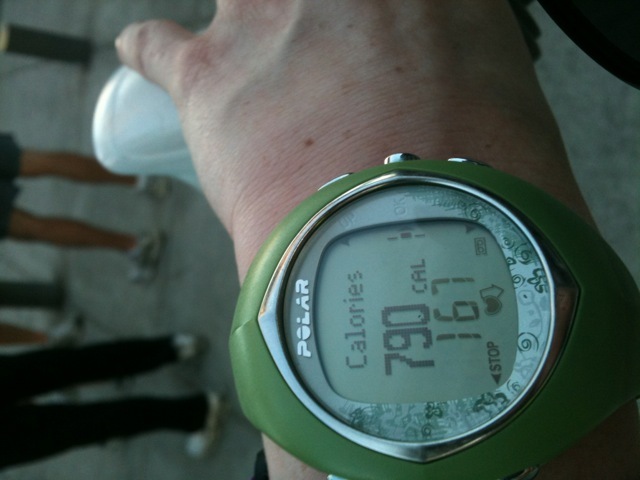 Right now I have a Polar Heart rate monitor. It tracks time, calories only. Bravo!!! It sounds like a blast! Yay!! I’m so proud of you! You totally rocked your first leg. I’m so jealous that you did this relay! I heard it was the mecca of all relays (compared to the other two that I did this year). It was so amazing!! I am so glad I did it. Words cannot describe how awesome it was. congratss!!! looks like a great time! we should get a blogger team together for next year, I’d totally be up for it! That is a really awesome idea, Morgan! An amazing sharing, as always! LISA, what can I say? You inspire, inspire, INSPIRE! To think you continue to conquer new mountains in your fitness and life style! I am as proud as if I was your momma! Can’t wait to read more and see you soon at work! This sounds like such an exciting event!!! 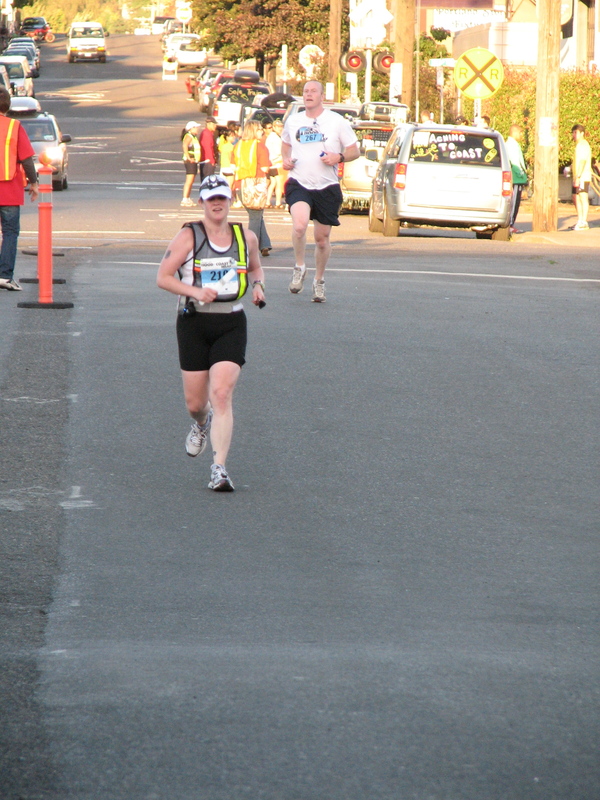 Races are great for getting your pace up and really showing you what you’re made off. You did amaaaazing! Congrats Lisa!!!! I can’t wait to hear about the rest of the race! I have sooooo much to share! Wow, great job! You worked really hard and you earned it.